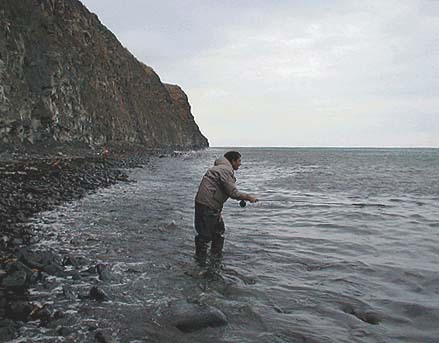 This year the fly fishing for mullet along my stretch of the Dorset coast has been patchy at best. 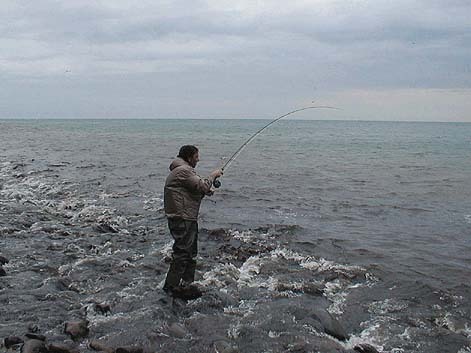 On the occasions when sufficient 'weed middens' and maggots have built up to attract the mullet the tides have been poor or the weather has been so rough that even getting a fly to the fish has been a problem. 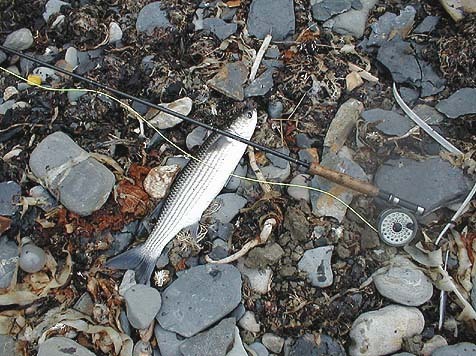 Of course, at times, there have been a few mullet feeding but often (unusually) they were far outnumbered by small bass. Catches of a dozen bass, up to three or four pounds, in a short session have been fairly commonplace but the odd decent mullet was a red letter day. Even when it looked perfect for some reason the thicklips rarely showed, particularly later in the summer. One of the last successful sessions was when I went down with Steve Pitts in late August. There were a few mullet mixed in with the bass and there was (characteristically ) a big swell, making fly fishing difficult. 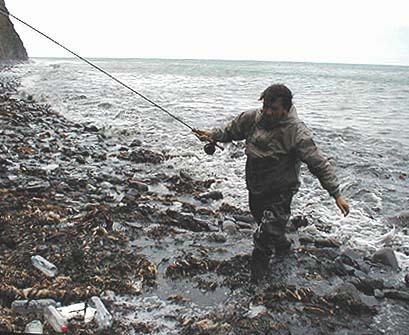 (As I write in mid-October there are lots of mullet feeding on the maggots from massive weed middens but, once again, the sea is very rough). Steve worked hard at his fly fishing, casting a maggot baited polyfly to the few visible fish. The sea was quite rough and the many bits of loose weed often meant a trudge up the beach to clear the line, cast and fly. At last a decent mullet was hooked and put up a strong fight in the surging swell. --- and it was all worthwhile when a four pounder was beached, unhooked and returned to the sea.